The Crystal Queen is a double decker paddlewheel boat that cruises the waters of the Intercoastal waterway and the calm back bays behind Atlantic City and Brigantine, providing views of the Atlantic City skyline. The 78 foot Crystal Queen, that has a 149 person capacity, was designed to replicate a 19th century riverboat. 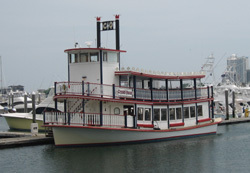 Its paddle wheel turns as it moves through the water, but it is actually powered by twin 250 horsepower engines. The Crystal Queen's home dock is at The Farley State Marina, which is adjacent to the Trump Marina Casino in Atlantic City, NJ. Atlantic City Black Whale Cruises operates the Crystal Queen. They specialize in Lunch & Dinner Cruises, Sightseeing Cruises and Private Charters for Special Events, Meetings, Weddings, Cocktail Cruises and Dinner Cruises. The boat is air conditioned. It has a liquor license and has bars on both levels. The Crystal Queen offers cruises twice daily, leaving Friday evenings and Saturdays open for special events such as corporate outings and weddings. The Sunday night entertainment cruises features local live bands.